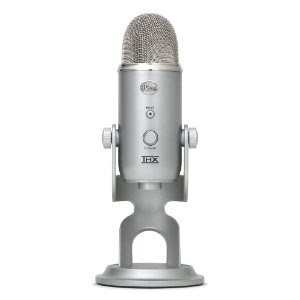 The MBA Show Blog: I'm trying really hard not to buy this microphone. I'm trying really hard not to buy this microphone. We'll have our first rocket-ship on SloanTV! Last week on the show, you might have noticed that the audio was good-not-great. We purchased a couple of microphones, but were unable to get any of them working on my MacBookPro using the line-in, so we ended up using the built in mic. We were blown away with the performance, but it's still just not the same as a great mic. One obvious solution? Use a USB mic! It's plug and play, and basically guaranteed to work. Plust the thing just looks really cool. The one shown here is called The Yeti. With a name like that, it HAS to be awesome. To be clear, we were blow away by the quality because our expectations were bargain basement low. How much does this none mythical microphone from the future cost? Also, my desire to swear in describing the beauty of this thing is pretty high. Targeting SloanTV - Who is our audience?